When two parents decide on a custody agreement and parenting plan, there may still be issues and situations that require legal help or intervention. One situation that can occur is when one parent wants to remove the child from Massachusetts or relocate for some reason. If you are faced with a relocation situation, it is recommended that you have an experienced legal representative in your corner. Massachusetts child custody attorney Stephen M. Forlizzi, we understands the importance of relocation decisions and the impact relocating can have on a child and the parents. We offer a free consultation to get a better understanding of your unique situation. Our firm believes every parent needs an advocate who will fight to protect that parent’s rights and also work tirelessly to uphold the best in interest of the child. At a time when relocation is an issue, parents may be tempted to let emotions take over. We have the experience necessary to explain the laws and the clear-headed approach to help you get the most favorable outcome. If you or the other parent wishes to relocate or remove a child from Massachusetts, the other parent needs to grant permission. If that other parent does not give permission, you will have to go to a local MA court and obtain judicial permission to remove the child from the state. Removing a child without the needed permission from the parent or the court can result in custody being turned over to the other parent. It is considered a violation of shared custody rights to just take the child. However, in a domestic violence situation, it is recommended that a parent seek immediate legal help to get a restraining order. A restraining order may include permission to take the child out of state. These guidelines for removal or relocation apply to children born in Massachusetts or who have lived in Massachusetts for five years. A parent can’t simply decide to move out of state with no regard for the rights or visitation of the other parent. The parent wanting to leave Massachusetts must show that they are not requesting permission to leave as a means of keeping the other parent from seeing the child. The reason a parent gives should be shown as a choice that is in the best interests of the child involved. While the reasons can be as individual as the families involved, a judge must ultimately see those reasons as valid and then rule accordingly. Anytime you are involved in a removal or relocation case in Massachusetts, the decision and actions taken can affect every aspect of your life. The time you or another parent spends with child will be altered. There may be new transportation issues to work out and new scheduling conflicts. Our firm can help you navigate these decisions and changes. The ultimate goal of family attorney Stephen M. Forlizzi is to help any family get through a difficult time and help clients work towards the best interests of children involved. 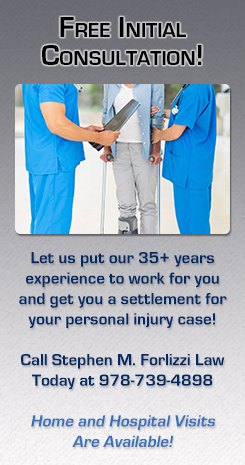 You can count on us to explain your position and to work diligently to get the best possible outcome for your case.